The New Year is approaching and you still haven’t reached your resolutions you set last New Year. Your debt hasn’t gone down much, or maybe has even gone up in the last year. So how can you get out of the cycle and get closer to debt freedom in the coming year? 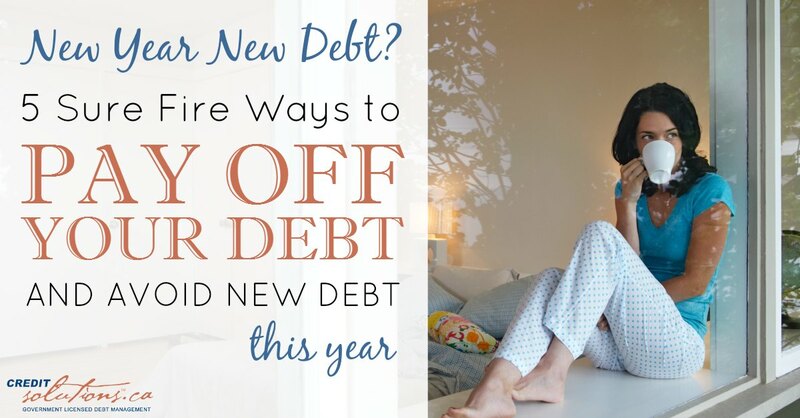 Here are 5 sure fire ways to pay down your debt and avoid new debt in 2015. VICTORIA – Enhanced protections for B.C. families, particularly those in financial distress, are at the heart of legislative changes introduced today by the B.C. government. The Province is taking action to regulate the debt settlement industry with amendments to the Business Practices and Consumer Protection Act (BPCPA). If passed, these amendments will prohibit debt settlement companies from charging fees until both the debtor and creditor have approved a debt repayment agreement. These amendments will also lay the foundation for additional new rules to safeguard consumers which government aims to bring into effect in fall 2015. The student loan program originated in Canada partly because of the wave of social justice that swept through governments and society seeking out fairness and equality for all in the 1960s. It was noticed that only the wealthy were attending the publicly funded universities. The poor and middle income families could not afford to attend. The early pioneers for a more just society, in many respects, embarrassed governments into realizing that publicly funded educational institutions should be affordable and available to basically everyone in society, not just the aristocracy. The birth of student loan program became a bit of a compromise between free post-secondary education for all and partially subsidized financial assistance by way of a student loan for the non-wealthy. The compromise was this: the student loan was affordable, tuition was low and the cost of living was reasonable. Bursaries and scholarships also played a significant role in the funding paradigm that helped so many attain a post-secondary education. It wasn’t until the 1970s that the debtor-creditor relationship first began to sour. A few student loan debtors didn’t repay the student loans. This irked an emerging debt collection mentality that held the belief that if you didn’t pay your debts then maximum punishment should be inflicted upon the debtor. No mercy should be granted to the debtor. No review of the extenuating circumstances was necessary. Just punishment. Harsh, severe and unforgiving punishment. This was a time, the 1970s, when the total consumer debt in Canada excluding mortgages totalled $20 billion. Today it’s over $530 billion. The debt collection mentality never seemed to mellow with student loan debt while in the wider society, commercial creditors balanced their very miniscule losses to their enormous profits. In fact, the banks and governments in the 1990s preferred to outsource the nastier collection problems to collection agencies. The Bankruptcy and Insolvency Act was reformed in 1992 to, in part, to remove the punitive element to debt problems and insolvency, streamline the discharge process for both debtors and creditors, and encourage settlements and proposals. By this time, the old school notion that debt and debtors were bad and needed to be punished if they defaulted on their debts had undergone a societal overhaul. We had become a credit society where debt was a normal and a socially accepted part of our lives. To make a long story short, in 1997-1998 the student loan debtor was isolated from all other debtors in bankruptcy and received punishment more severe than any other debtor in bankruptcy except for those who committed serious offences. Student loan debtors were denied a discharge from a bankruptcy for 10 years. The early efforts of governments to provide affordable funding for the poor and non-wealthy families for post-secondary education had long since left the building. The student loan debt along with consumer debt had grown to almost $200 billion in the 1990s. The attitudes towards debt and debtors had indeed changed in bankruptcy, in borrowing and in lending. The amounts lent to students had long abandoned the principle of affordability. In the Vancouver Sun article, a picture is painted about hundreds of UBC students attending food banks who cannot afford to buy food. A similar phenomena unfolds at Simon Fraser University. The cost of living, especially high rents and high tuition fees are cited as the primary causes for the financial struggles for non-wealthy students. This precedes the mountain of debt that awaits many after graduation. Despite the many differing opinions on student loan debtors, for sure, the pioneers of social justice in the 1960s did not foresee this outcome. Starving students are a few good reasons to go back to our roots and rethink the costs of post-secondary education. The mountain of debt that follows is another.